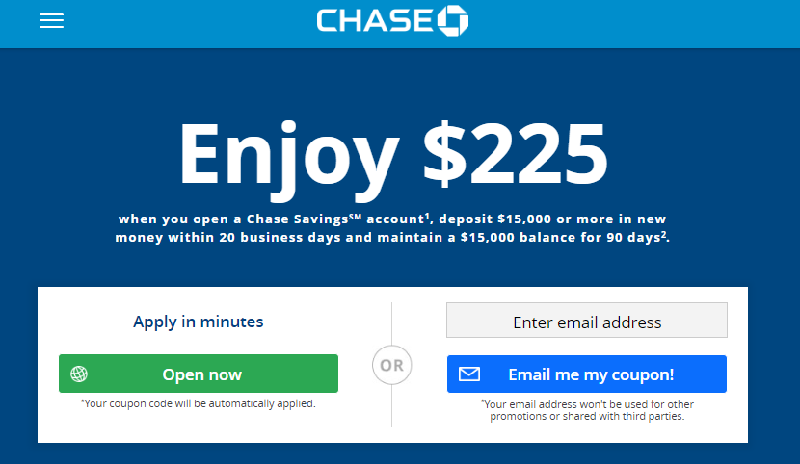 Chase Bank is currently offering qualified residents nationwide a $225 bonus when you sign up and open a new Chase SavingsSM account by August 6, 2018. If you are interested in this generous offer, all you would have to do is apply online or request a coupon and head over to your local branch. To get started, simply deposit $15,000 or more in new money within 20 business days of account opening and maintain that balance for 90 days. Once you have done so, you will have access to the generous bonus as well as a host of account features! If you are interested in the offer, I recommend you hurry on in today or apply online and be a part of one of the nation’s longest running and largest financial institution! Bonus not available to those whose accounts have been closed within 90 days or closed with a negative balance. The bonus is considered interest and will be reported on IRS Form 1099-INT(or Form 1042-S, if applicable). At the end of the day, the current promotion from Chase Bank is a great option for those who would like to start a new banking experience. Not only do you get to enjoy the generous bonus that comes with your new account, but you will also have the confidence and security of knowing you are receiving the best service and care the bank has to offer. If you are interested, I would personally recommend signing up simply because the requirements can be easily met. If you have extra fund and would like to earn more, you can check out Chase Coupon $300 Savings Bonus review instead. I would definitely recommend this promotion if you have the funds available. Feel free to comment below on this Chase Bank Review article to tell us about your banking experience with Chase!